The firework is finally completed and launched…but Menma is still there. They try to figure out why, but Yukiatsu thinks he knows: none of them really genuinely wanted Menma to rest in peace for her own sake. So they decide to apologize to her and say goodbye properly, but can they do so before Menma disappears? I kinda wish that either Menma’s brother or mother had been able to see her go, though I guess it’s just as well the five who knew she was there were the ones to see her. At least Menma’s mother finally seemed to get over her resentment for them. While I like touching endings, it seemed like they said goodbye one too many times in this one. I mean, it didn’t make the episode bad really, but I think it was getting to the point of “OK, is she ever going to actually, you know, disappear?” Not that I was cheering for it, but you knew it was going to happen, and the scene seemed to linger for just a bit too long. Also, while we get a hint of future things, such as Naruko and Jinta getting along, it’d been nice to have it be more definitive. I know, most series don’t bother to do that, but I always find it nice to be more assured of the happy ending you’re looking for than merely “they seemed to be on good terms” which they already were. 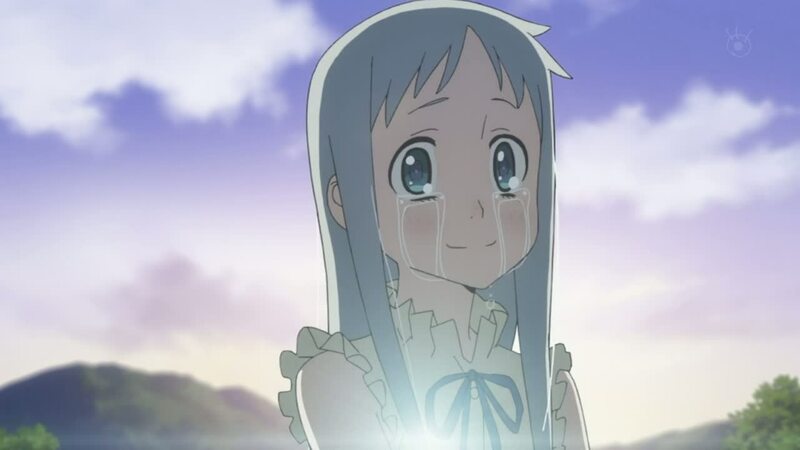 Overall, I’d say this was a pretty good and touching series, though interestingly enough, perhaps the least interesting character of the whole series is the one who is the center of it all: Menma. Sure, she’s cute, and one really sympathizes with her when she tries to communicate with the others, but can’t, but in a sense, that is almost all she is. We really don’t learn much about her personality except that she’s childish and she likes Jinta, which is presumably why he is the one who can see her. She does finally get some depth in the final episode, but by that point it’s pretty much too late. Everyone else’s characters are far more developed. That doesn’t make it a bad series, but I think it may have been better if we really got to see what about Menma made her the center of the group, besides just being Jinta’s and Yukiatsu’s crush (and by extension, Tsurumi’s and Naruko’s rival). The reincarnation bit also seemed to be a little out of place. It gave Menma the motivation to want to go, but seeing no definitive result from it also just kind of made it seem like something thrown in as an afterthought. I also never really got into Poppo’s character. Again, we never really find out his real motivation until the final episode, and even then it just comes off flatter than everybody else’s. Naturally, it can’t be easy to be the one to see your friend die, and I’m sure he’s haunted by that image, and in a way, perhaps he is the one who is the worst off because of it. But his exuberance and his willingness to believe Jinta from day one just doesn’t seem to fit. The other characters were more believable, either not beleiving Jinta from the start, or playing along until they finally decided he had gone too far, before Menma was actually able to show she was there. Having said all of this, I think the journey one takes through this series still makes it a good watch, and one still feels for all the characters in the end, despite the flaws in the series. Many times you can cut the tension between characters with a knife, because of the cloud Menma has left hanging over them, and it’s nice to see all of them finally accept their loss and move on with their lives in the end.